I thought I would not log on at all during the weekend, but found a few minutes of online time before heading to bed. 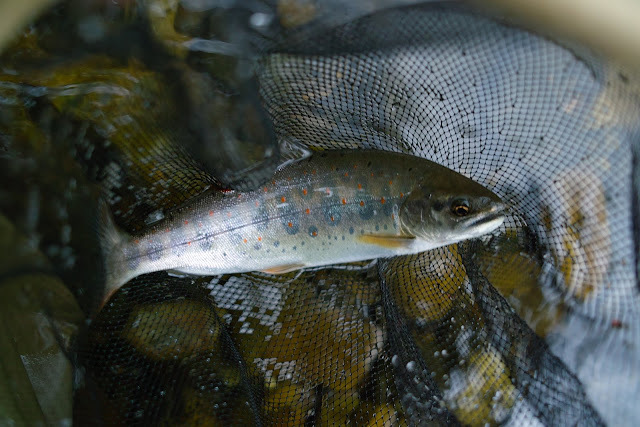 This morning I drove to Kaida-kogen, an area very popular among fishermen, for a tenkara class and fundraiser event with Dr. Ishigaki and Kurakami-san. I left Maze at 6AM, arrived here at 8AM. It rained a little in the morning, and then hard in the afternoon. There were moments when the scenery was just awesome, at other moments the visibility was very low. Here’s a shot from one of the clear moments of the day when a layer of fog raises above the stream. A little bragging, this morning I believe I was the only person to catch a fish in our group of about 15 people. And, in the afternoon I caught 4 fish, while the entire group had 1 fish among them. 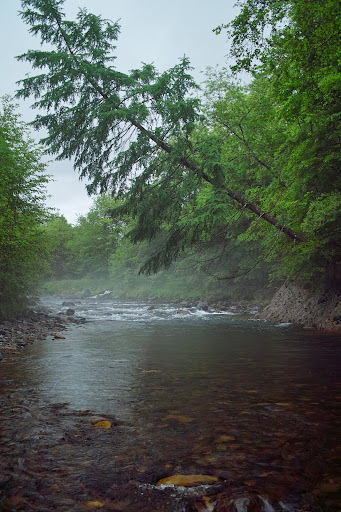 The stream has quite a few fish, but I believe the water was very cold today, and the fishing difficult. Not great numbers to really brag about, but it was easy to keep count today. Here’s Ishigaki-sensei doing a demonstration to the class. He’s finally ditched the vest!!! Yes, he said it’s too hot and he doesn’t carry that many things in it anyways. I noticed he wasn’t using a vest on the Itoshiro event, so I finally asked him if he ditched it altogether. 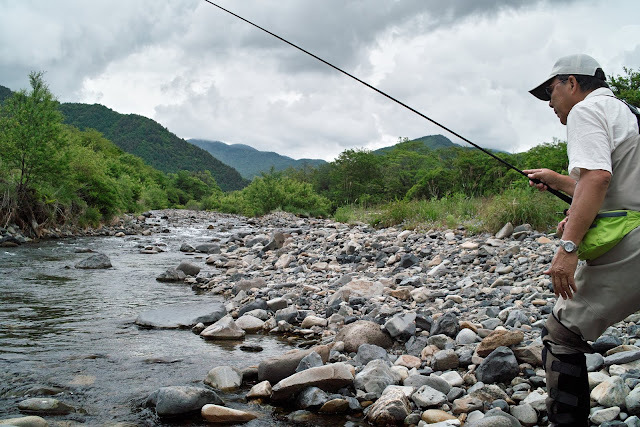 After fishing in heavy rain for about 4 hours, and catching my fair share for the day, I headed to an onsen. Just can’t seem to get enough of onsen, especially when it rains. I absolutely love that part of Japan for those rainy/cold days of fishing. The most fun today may have been the charity event after dinner. Dr. Ishigaki and Kurakami san are taking every opportunity to raise some money for the earthquake victims. But, the event mostly consisted of underpricing things and if more than one person wanted the item they had to do rock/paper/scissors. It was a great way to have fun, but not a great way to raise money. I donated a Tenkara USA tshirt and a couple of sets of flies, those may have been the most popular items tonight. 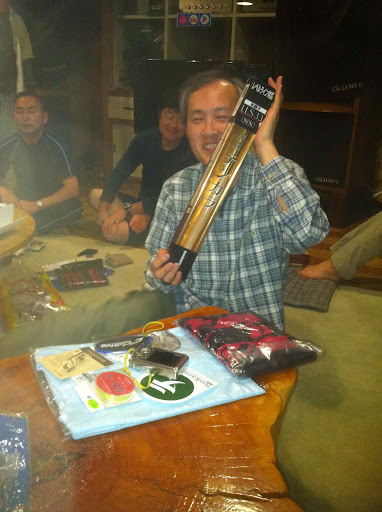 Then, the last item was the giveaway of a brand new Shimano tenkara rod. All those present participated in a rock/paper/scissors game to win the free rod. And, guess who won… yes, I did! But, I truly have no use for it as you may imagine, so I decided to turn it around and introduce an American-style auction into the party with bids starting at $50. The auction raised about $80, still a great bargain for the winner (photo below), but an additional chunk of money for the earthquake victims. Dang!! What a fun entry. Looks like the rock paper scissors doesn’t fetch quite as much as highest bidder. :0) Very cool! You learn new things every day. I figured scissors/rock/paper to be an American activity little known elsewhere. Turns out it has quite a broad application. Its known by different names on every continent. Has applications in biology and was once used to settle a dispute in Federal Court. And is apparently common in Japan in situations as you described – it was used in the selection of an Auction House in Japan when a corporation wanted to auction art works by some the worlds great artist. There are even international societies for the game. Amongst other things according to the wikipedia entry. Who knew? Thank you for the beautiful amago picture. Enjoy Onsen, which I miss so much. Safe and fun trip!